Carrying a phone on the slopes isn't just a good way to make sure you don't freeze to death after careening off an unseen ledge. With the right apps, it can be helpful in non-emergency-related ways, too! Ignoring occasional glitchiness—particularly with remembering favorite resorts through updates—it's hard to fault North Face's Snow Report app. Its feature list reads like the results of a brainstorm session titled, "Why the hell would anyone want to bring a smartphone skiing with them?" which is actually, probably, pretty much this app's origin story. This means: quick weather updates for virtually any resort, trail maps for quite a few; on-the-ground details, like ski lift running times and snow totals; and a basic route tracking function. Free, iPhone. An all-in-one personal GPS app that you should probably have anyway, MotionX GPS excels at one broad function: tracking where you've been. Which is pretty important for a skier, I think! By keeping this app running all day, or at least during runs, you'll end up with a full readout of distance skied, elevation gained and lost, top and average speeds, etcetera. It's just as fun to pull out at the top of a run, too, to get a birds-eye topological view of what you're about to tumble down, complete with altitude data. 3, iPhone. • iTrailMap 3D: The idea here is to provide trail maps to skiers while they're on the slopes, in 3D. Fun, but of limited utility. • OnTheSnow: Basically like The Snow Report, minus a bit of polish. A worthy alternative, however, if you find the North Face's app's data lacking in one way or another. • SkiTips 1 (and 2 and 3): Lil' bit hokey, this app, but the videos are instructive, and answers all the questions that fall under the "How do I not die on my skis?" and "How do I not look like someone who is about to die on my skis?" umbrellas. It's simple, you need snow to snowboard (or ski). And hell, staying in tune with snow reports is half the planning process because the better the snow, the better the run. Ski & Snow Report helps you gather all the information you can, with pretty comprehensive snow reports of ski resorts around you. The app gives current conditions on the base snow depth, how much snow will fall in the next 24 hours, lets you check out webcam images to see what's happening, and even see how many lifts and trails are in use. 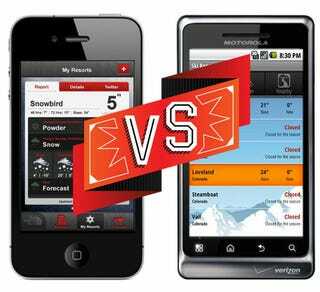 It's a must have app for any Droider planning a ski trip.Free, Android. When you're up on the mountain, cell phone service isn't exactly full bars and poppin'. So having maps stored on your Android phone is infinitely more useful than an app that pulls maps using a data connection. Ski Trailmaps gives nearly 1,000 maps from all across the world and loads them onto your SD card, so if you get lost, you'll have a pretty clear idea on how to get back. Some of the images aren't exactly high res, but it's definitely readable in a pinch. Upgrade to pro for unlimited snow reports, weather forecasts and ski webcams too. Free, Android. $2, Android. • Android Ski Report: Gives basic ski weather reports but only available in a limited amount of ski resorts. • Crazy Snowboard: If you can't hit the mountains, why not play a snowboarding video game instead? With 30 levels, unlockable boards and players, and sick tricks, it's boarding without the spills. And it's free!